The Commtel COM112 shows great resemblance to the UBC50XL. From the inside, this scanner is built up differently. The Commtel 112 uses an MC3359 receiver IC, with the unfiltered baseband audio on pin 10. 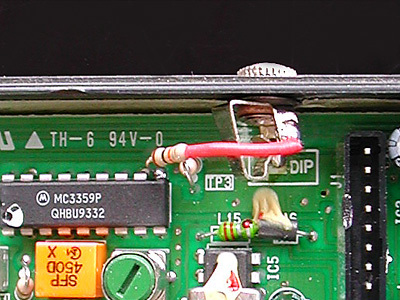 A 10 k resistor is connected to pin 10 of the MC3359. A 3.5 mm chassis terminal is mounted in scanner's side, close to the receiver IC. If you scratch away some paint from the circuit board at the arrow left of the letters 'DIP', the ground lug of the chassis terminal can be soldered directly to the board. 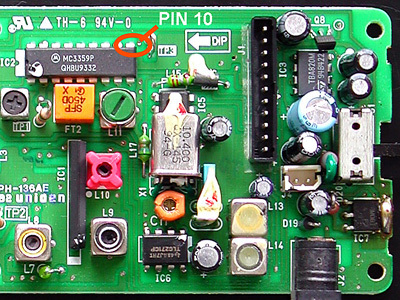 The resistor can be connected directly to the other lug of the 3.5 mm plug. Optionally, you can put some isolation material on the lead of the resistor.